Small concrete mixing station model recommended! In general, the type of concrete batching plant used for small and medium-sized projects will not be too large, but many customers do not know how to choose a specific one. In this paper, we recommend several types of small concrete mixing plant models. 1.HZS25 type batching plant: The HZS25 type batching plant is a small-scale simple batching plant, which is also the smallest type of concrete batching plant model. The theoretical output of this equipment is 25 cubic meters per hour, which has the advantages of simple structure, convenient disassembly and convenient construction. The cost is relatively low, and it is suitable for large-scale prefabricated component factories and small roads, bridges, and other industrial and civil construction projects. 2.HZS35 type batching plant: The HZS35 batching plant adopts modular structure and modularization of the unit. It is very convenient for installation and removal. Compared with the HZS25 batching plant, the biggest difference is its different production efficiency. The HZS35 batching plant uses the JS750 forced mixer. 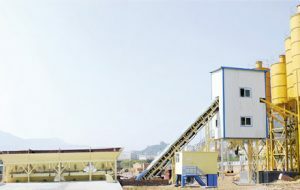 The theoretical production capacity per hour is 35 cubic meters, and the user can specifically select the dual-station or single-station according to his own demand for concrete production. 3.HZS50 type batching plant: HZS50 batching plant is actually a simple configuration of HZS60 batching plant. The same as HZS60 batching plant uses js1000 mixer. It only differs in the way of feeding. It is really a 50 batching plant. The bucket loading method, which occupies less capital than the 60 batching plant, has a small footprint, a small number of deployed equipment, and a theoretical productivity of 50 cubic meters per hour. It is an ideal equipment for building bridges, roads, construction sites, and components. This entry was posted in Solution and tagged hzs25 concrete batching plant, hzs50 concrete batching plant, Small concrete mixing station by camelway. Bookmark the permalink.